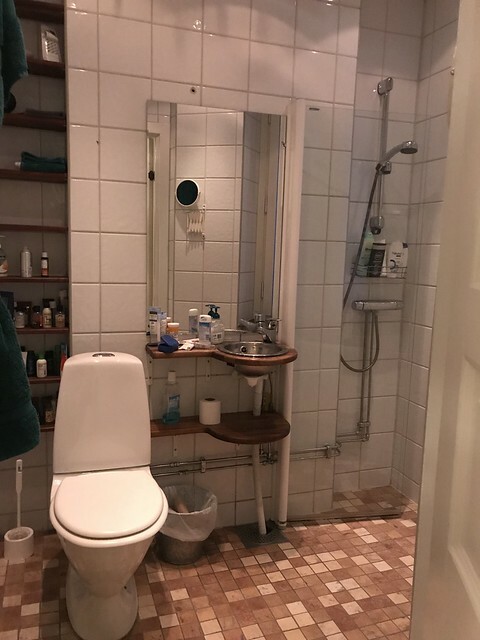 For those of us used to North American bathrooms there are many oddities about European bathrooms that tend to stick out. I don’t mean to scare anyone away from making a trip to Europe but there are some aspects to be aware of in advance. These are mere observations from my own travels, the list is by no means exhaustive. Most showers in Europe have a “wand,” or a shower head attached to a hose. There’s often a place to clamp this to take a hands-free shower, though the freedom of the wand can be useful to clean hard to reach areas. It can also make a giant mess if you’re not used to showering with these things. Try not to spray the entire bathroom with water. Shower stalls in Europe seem to vary between the size of a phone booth (if you remember those) to the size of a bathtub. For the most part you’ll be dealing with the phone booth showers. If you’re lucky there will be shower walls, if you’re not so lucky you’ll have a tiny curtain wrapped around you. Some older bathrooms don’t have a shower enclosure at all. It’s just you naked in the corner of a bathroom spraying yourself with water. Some hotels have a rope or chain in the shower that you should pull in the event of an emergency, such as if you slipped and hit your head. If it’s not an emergency though, don’t touch it. Newer hotel bathrooms usually don’t have these, and in older hotels… who knows if the thing still works? Most European bathrooms have a drain in the bathroom floor. 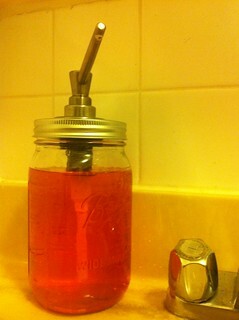 This can be an advantage if you spill something, the sink or toilet overflows, etc. In some cases the shower drains into here as well — or even the sink. Look closely at the photo above for an example of a drain that does all three. If you get the floor all wet showering it may take a while for the water to reach the central drain, so be careful not to slip in the meantime. In private home bathrooms (friend’s places, Airbnb apartments, etc.) the hot water heater isn’t intended to be run all day. Instead there will be a switch — usually a circuit breaker — that activates the hot water heater. If you can’t get hot water you probably need to ask where to find this switch. Remember to flip the switch off when you’re done as energy is expensive in Europe. Hotel bathrooms in particular often have a pair of hot and cold knobs on the wall that don’t appear connected to anything. I think these are shut off valves? Whatever they do, leave them alone. Toilets with a tank above your head. You’ll either have to push a button on the tank or pull a chain to flush these. Shorter people and children may have trouble with these. Tanks on the toilet with a metal circle featuring a larger button and a crescent button. These are two options, you push the crescent shape for a small flush and the larger button for a bigger flush. Save water and only use what you need. A rectangle on the wall. This is common in newer bathrooms where the tank is hidden in the wall (Europeans love hiding stuff in walls.) Just like above there are two buttons; one for a big flush and one for a small one. In public bathrooms the big plastic buttons are occasionally broken off by vandals, but you can still flush them by tapping the exposed levers. If you’re in a very old European building the toilet may just be a hole in the floor. It’s easy for men to pee in, but for all other purposes you’ll need to assume a squatting position as there is no seat. These aren’t commonplace though on rare occasions you might still find one in a restaurant or bar. Typically these are flushed by pulling a chain. Those used to traveling in modern Asian cities (or working at Google) will be familiar with bidet toilet seats, but some European bathrooms have standalone bidets. These look like a cross between a sink and a toilet. Old sewer systems can’t necessarily handle toilet paper. This is true worldwide though in Europe the state of the sewers varies wildly from one place to the next. If you occasionally forget and flush a few pieces of toilet paper it’s no big deal, but if you don’t know about this and try to flush a lot you’re in for a world of trouble. Those garbage cans are there for a reason — and they need to be taken out regularly. Always ask if you can flush toilet paper before using the bathroom. Dirty toilet paper aside if you look under the sink in any American bathroom, you’ll see a U-shaped pipe connected to the drain. This is called a “trap” because it traps a small amount of water, which prevents bad smelling sewer air from wafting into the bathroom. In Europe these are often not present which leads to bathrooms that smell not just like a sewer, but like an old sewer. You’ll want to keep the bathroom door closed at all times if this is the case. Again on the theme of private home bathrooms if there’s a washing machine in the home it’s most likely located in the bathroom. Washing your clothes in the bathroom makes some sense, but if it’s a foul smelling bathroom you may want to consider alternatives. Don’t expect to find a dryer at all — Europeans tend to hang dry their clothes. Look for a rack in the home to hang your damp clothes on. Running an extra spin cycle in the washer can help dry out your clothes too. Public bathrooms in Europe often charge money. Some take coins, others take credit cards. You’ll find these everywhere from standalone restrooms in public plazas to train stations. Bathrooms in cafes and restaurants are usually free if you make a purchase so try to strategize bathroom breaks while you’re out. Oh and PLEASE don’t just pee on the sidewalk to avoid pay toilets. The locals will hate you, and if enough people do this they’ll develop a (legitimate) grudge against tourists. It’s sexist in a way, but if you’re a guy and not concerned about washing your hands you can often find a free urinal-like toilet. Sometimes these are drains in the ground, they may be temporary structures, other times they look like a sink without a faucet. The name says it all — it’s a place to piss. Most of Europe has excellent tap water but that’s not true everywhere. On Greek islands for example you shouldn’t even use the tap water to brush your teeth. Always ask if you’re unsure. One sign that the water may not be clean is when the hotel includes free bottled water. 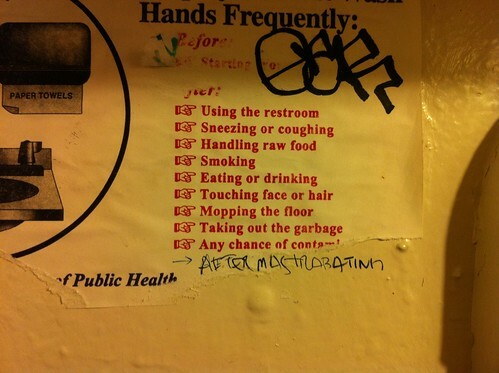 Not sure if Pi Bar really has a problem with this in their bathroom, but it’s good advice nonetheless. Enjoy urinating on the floor? 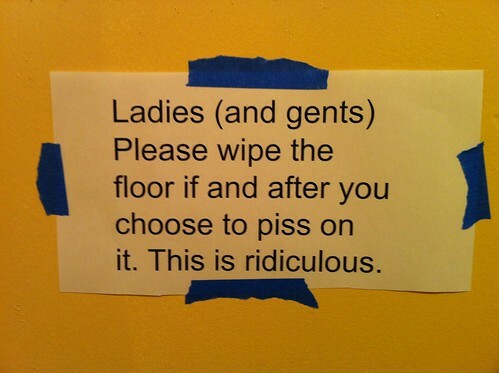 Better stay away from Noisebridge, where your poor potty manners will be chastised by the above passive-aggressive note.